Hopefully you've seen how fixing the wiring can make a big improvement to the light output with the basic harness. 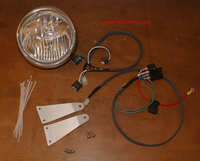 The obvious next step after making the stock headlight work as well as it possibly can is to find the best replacement headlight that's easy to install and looks right on the bike. I believe the CB600F/Hornet/599 headlight is that headlight. An H4 bulb has two filaments. One gets used for low beam, the other for high beam. This leads to two problems: 1) you can't run the high and low beams at the same time without reducing bulb life, potentially losing both beams at once in a catastrophic failure (glass breaks from excess heat) and 2) the reflector design is at best a compromise between high and low beams. 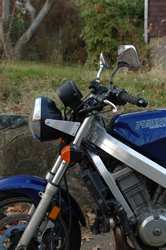 Modern H4 reflectors are better at this than older ones (the 919 and SV650 come to mind), but it's still a compromise. If you design the reflector and lens for a really good low or high beam, the other one suffers since they're both using the same reflector. The end result is the best compromise the engineers could come up with. It is a compromise. By comparison, the 599's headlight has dedicated high and low beam bulbs and reflectors in a single unit. This results in a low beam that has a really good beam pattern: very little scatter into the trees, light where you want it, and not where you don't. 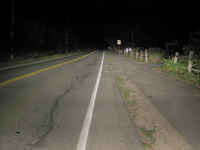 The high beam is designed to be used with the low beam, not instead of it. The low beam stays on with the high beam so you can design a reflector that puts the high beam light where you want it: down the road, without sacrificing visibility close up. The results are really impressive. Another factor is raw light output. The stock H4 bulb is a 60/55 watt high/low that puts out 1,650 and 1,000 lumens respectively. 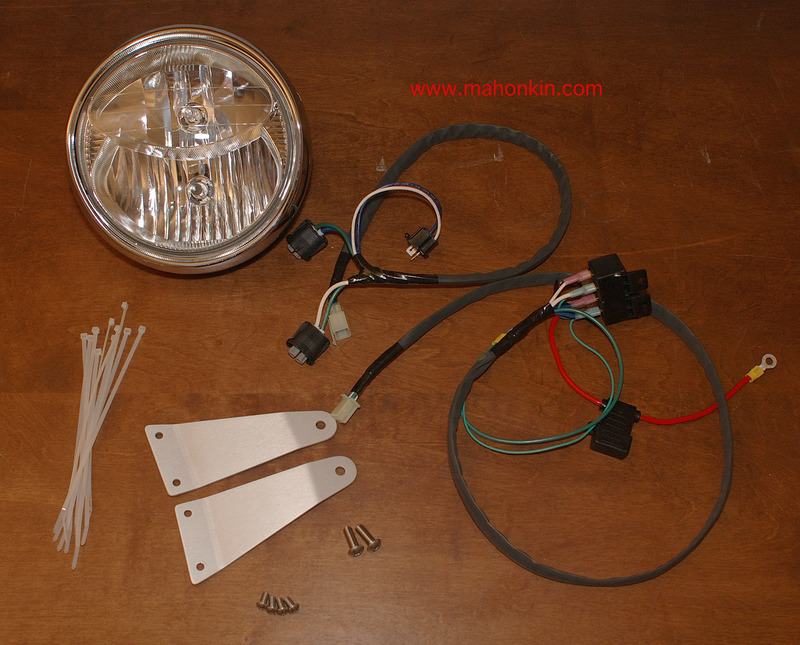 The H11 low beam is a 55 watt bulb that puts out a respectible 1,350 lumens. The H9 high beam is a 65 watt bulb that puts out a remarkable 2,100 lumens. That's 30% more light on low beam, and a whopping 100% more light on high beam. This light is put where you want it too, not wherever the "best compromise" H4 reflector puts it. Here are some pictures of the light output. It's probably not necessary to mention #20, but if you don't have this for some reason (going from a different aftermarket headlight, or back to a stock look from a fairing) you'll need to figure out something to make this work. The cost of this kit is $330 plus shipping. Shipping will be $10-$15 to the lower 48, depending on where you have it shipped. contact me about shipping elsewhere. If you've purchased a harness from me before and want to upgrade, I'll give you $20 back if you send the old one back in working condition. Unfortunately the original harness is not compatible with the 599 kit, there are too many differences to make an "upgrade kit" practical. $20 isn't a lot, but it takes some of the sting out of $330. At this point it takes a not insignificant ammount of time to get the parts from Honda, so there may be a wait while the parts come in.